What does it take to build an app? According to a popular African proverb, it takes a village to raise a child. 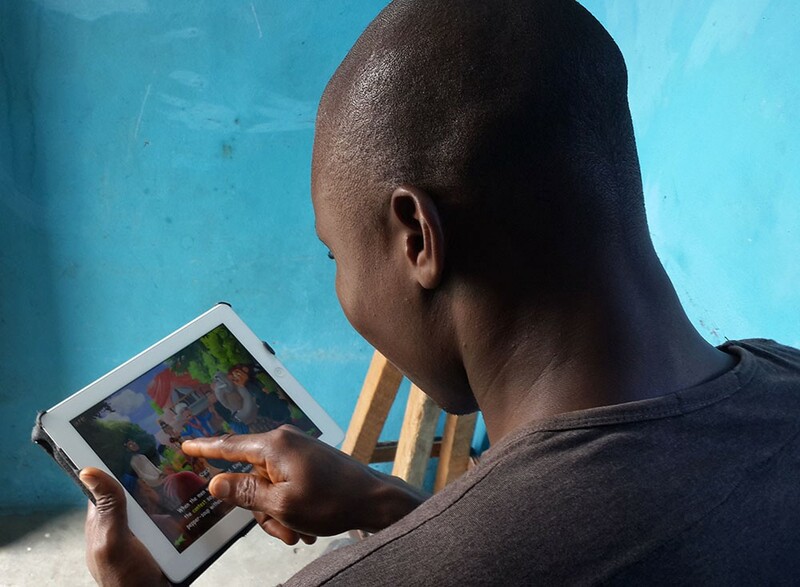 In the same vain, while it may seem like it takes only a team of nerdy folks to develop mobile apps, my experience developing Genii Games’ Asa brand of African Culture teaching apps paints a different picture. Developing these apps that touch on deeply rooted traditions and Cultures require the involvement of people who have little or no knowledge of technology tools. Though little is often said of their roles, these individuals together with their contributions represent interesting angles which make the app making process truly worthwhile hence, an experience worth sharing. Before delving further, it helps to understand the context to mobile technology adoption in Nigeria from my perspective. Much has been said of the growth of mobile technology across Africa. Without seeking to repeat same commentary, it’s on record that the penetration of mobile phones across Africa dwarfs the rate at which the PC itself has been adopted over the same period. The obvious reasons vary from affordability, portability to less power consumption. In the last few years, Smartphone adoption has also been on the rise, thanks to the introduction of cheap Android devices mainly from China. Even at that, there’s very little support from big players like Apple whose market share lies with a tiny percentage of Africans in the upper class. Amid the media focus, narrowing the gap between mobile technology adoption and its literacy vis-à-vis its optimization as we see in other developed societies remains a work in progress. It helps to understand that there is indeed a class of individuals with zero knowledge of the capabilities of mobile phones beyond its use as a voice and text messaging communication device. For these ones, the most probable only other use of the mobile phone includes illumination and listening to music. 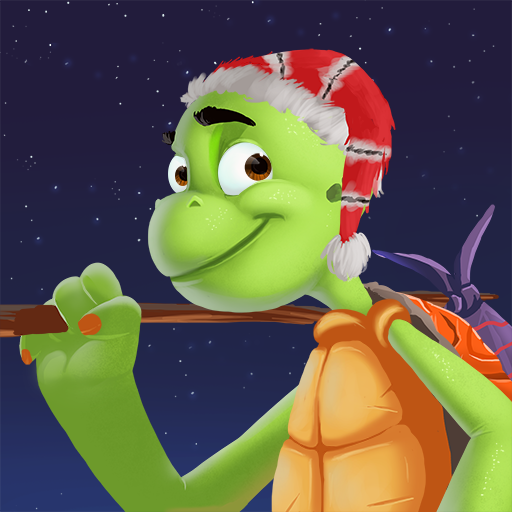 When as a team, we decided on adapting stories in our Adventures of the Tortoise app to different Cultures in a bid to further promote its diversity, the Efik Culture was one of our early picks. The Efik Culture is a beautiful one in Nigeria with rich features that can be seen in its colourful festivals, delicacies, language, marriage rites, dressing etc. 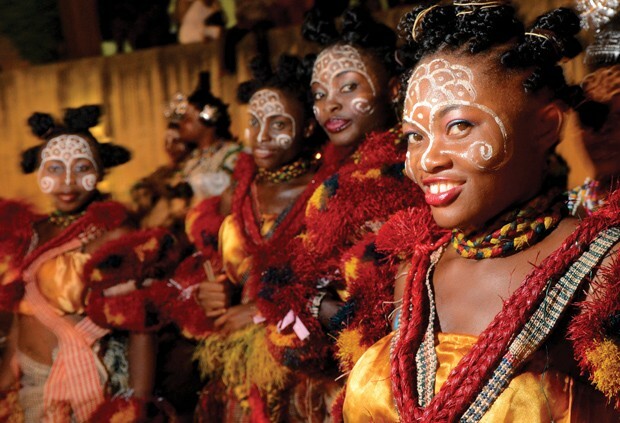 Since we wanted users of the app to see the beauty of the Efik people in simple terms as we could portray in their dressings, naming and even pronunciations, we set out to find individuals who hailed from the Efik ethnic group to help us with firsthand information beyond what the internet could offer. Thus, I approached Bassey. For one, none of us on the team had yet been to the South-South region of Nigeria. Bassey whose real names are Nsa Effiong Okon is the Chief Security Officer of my gated community. Bassey as he is fondly called is from the Efik speaking Culture of Nigeria predominant in the South-South states of Cross-River and Akwa-Ibom. Bassey is one of many average Nigerians residing in Lagos, a city of over 15 million people drawn from arguably every ethnic group in the country. Lagos as the commercial nerve center of Nigeria offers various opportunities for many. As the security officer, he mans the central gate helping with tasks as screening visitors, cars etc. In summary, Bassey’s one reason folks in my community sleep with both eyes closed. First, I explained the context to him talking him through what I do. Next, I showed him some of our old works. Though, I couldn’t tell if he understood all that I said especially with regards to my career path as a Tech entrepreneur, he was more than excited to be a part of it. 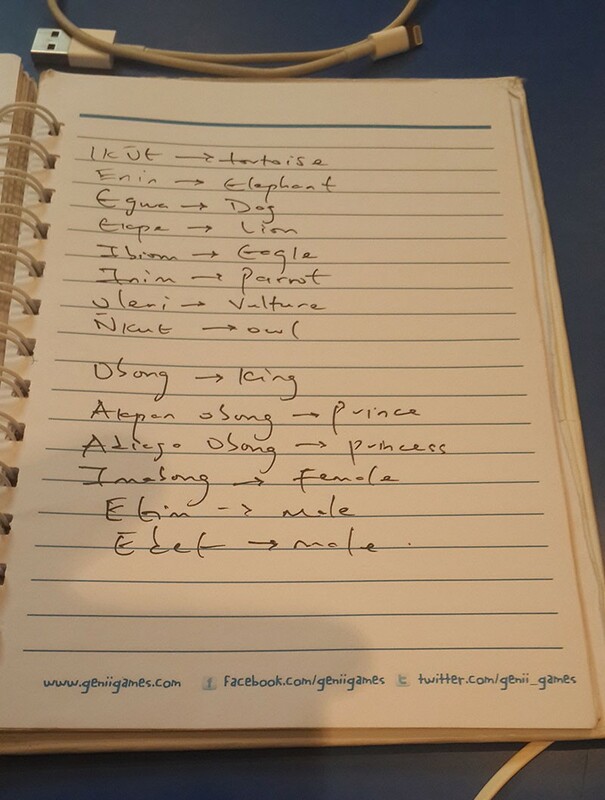 Bassey provided me with the Efik term for Tortoise: Ikut. He also provided me with the term Obong saying it is akin to calling someone an Otunba, a term for describing men from royal backgrounds. Hence, an Obong is a term associated with the royal lineage in Efik Culture. Prior to that, I’d taught, an Obong referred to just one King like the Yorubas have the Ooni of Ife. I also needed a popular name for the Princess which Bassey provided. He told me Imabong is a popular Efik name though if we wanted a name to fit the context, we’d have to settle for Adiaga Obong which is a Princess. If I wanted a Prince, then his name would have to be Akpan Obong. Furthermore, Bassey helped me with the pronunciations which we recorded using my phone. That recording was shared with the voiceover artist prior to the audio session. About 2 weeks ago, I revisited Bassey with the finished work. When I asked if he had a Smartphone with which he could download and view the app, he said he didn’t so I shared my iPad with him. Oh, I did also add Bassey to the credit page. It’s under the Parent Section of the app. 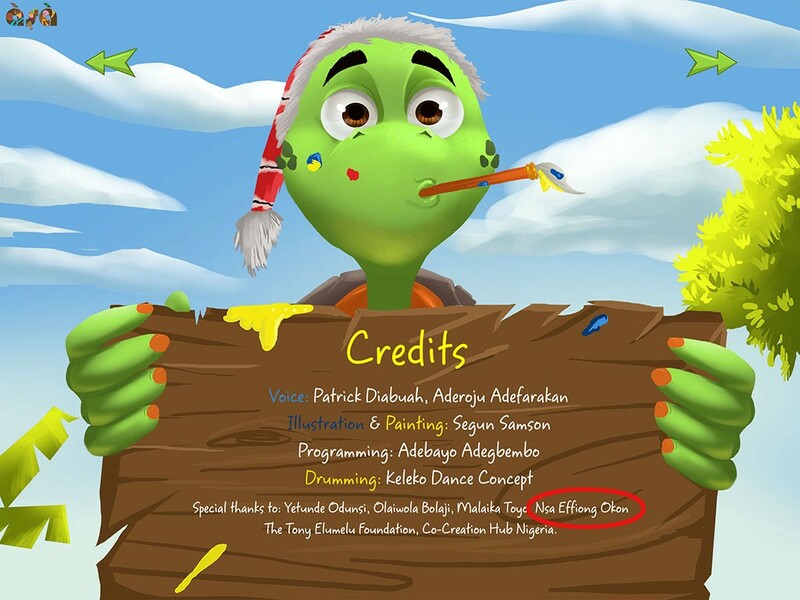 Bassey’s contribution is explicitly acknowledged in the app. I’ve highlighted it in red here. 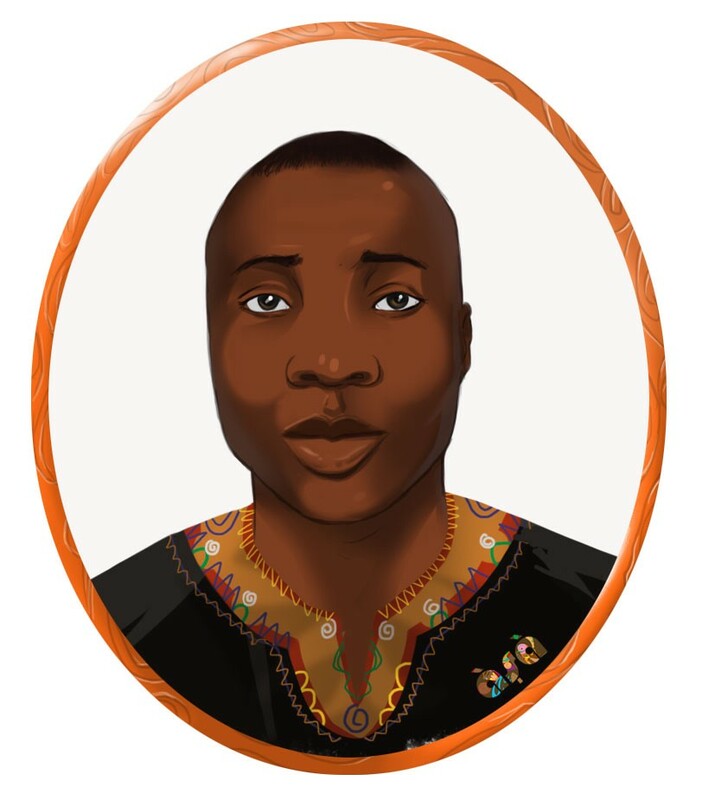 Lastly, we formally inducted Bassey into our Loyalty Reward Program, Asa Ambassador by illustrating this piece of him. 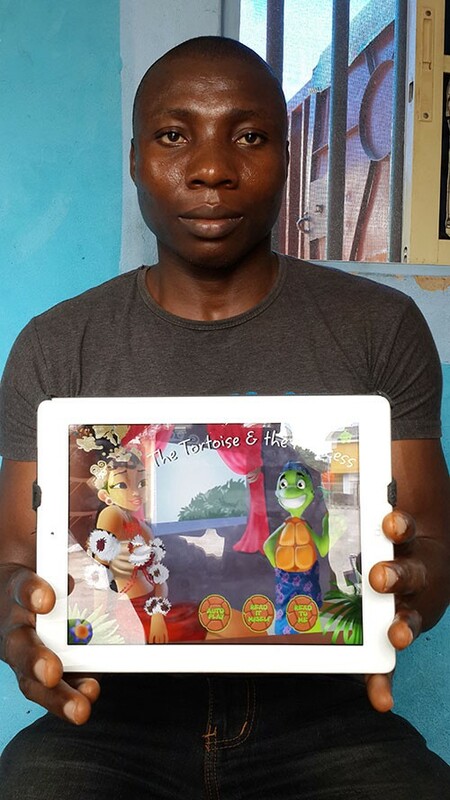 In the end, Bassey was more than happy to contribute his knowledge to our app. He told me he’s just happy to be making a contribution plus, the growing smartphone rave would soom catch up with him just as the feature phone caught up with everyone. I assured him, his work was here to stay hence, he could have access to it anytime. For me, his smiles said more than just a fascination with the beautiful graphics. Rather, they speak of an appreciation of seeing his beautiful Efik Culture projected and promoted in the limelight. It brings with it a good sense of appreciation, pride and belonging in the present age where Cultural traditions are best relegated to the background or given little notice. 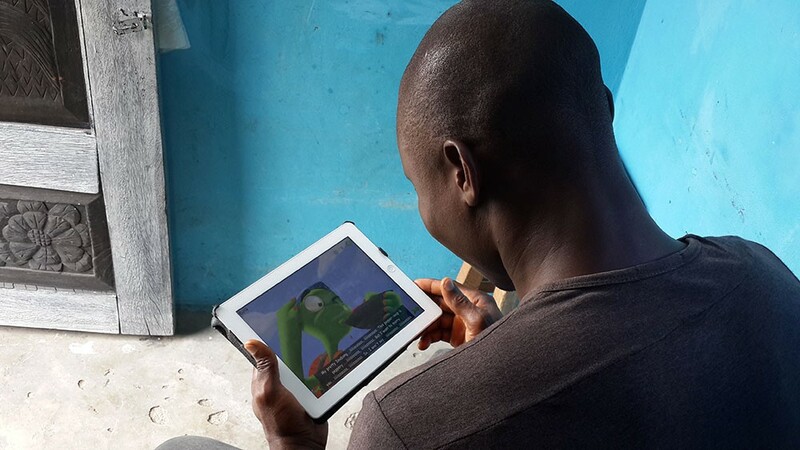 Passionate about recreating African Cultural narratives for people of African descent via @genii_games.